In everyday life you sometimes have to admit you’re wrong. No one likes to do it, but we’re all better off for it. You better start getting that “I was wrong” speech ready after you see these 17 common products that you’ve been using wrong your whole life. Keep your peanut butter the perfect consistency by storing it upside down. This way the oils distribute evenly and keep the peanut butter extra delicious. The long necks of beer bottles are meant to be used to hold onto them. That way you get a good grip on your beer and avoid heating it up with your hand. Stop trying to peel your bananas from the top down The best way to do it is from the bottom up. Check out this tutorial video if you don’t believe me. Wooden spoons are awesome because unlike they’re plastic counterparts, they don’t melt. That function comes in handy when boiling things. Lay your wooden spoon across the pot and it will absorb the extra heat and keep the pot from boiling over. Never get your extension cords accidentally unplugged again. I’ll wait a minute for you to pick your jaw up off the ground. Never fish for your straw again while drinking a soda. Simply use the soda tab to hold your straw in place. Beer is delicious, but it can be used for so much more than drinking. Give it a try marinating meat, or even polishing gold or wooden furniture. Beer is just that amazing. Finally end the frustration of an unwieldy aluminum foil box. There are creases you can push in on either side of the box that will keep the roll in place. You can thank us later. Forever ensure that you have easy access to your bagged snacks. All you need to do is roll up the bottom of the bag. Delicious. Contrary to every toothpaste ad ever, you only need a small amount of toothpaste for it to be effective. The rest is just a waste. What? How can anyone use plungers wrong? The type of plunger shown above is the most iconic kind of plunger, but it’s actually designed to be used on sinks, not toilets. Sit up straight! How many times did you hear that growing up? Well the truth is that those who slouch actually have fewer back problems than those who sit up straight. Maybe it’s time to get ride of those straight back chairs? Need to be somewhere in a hurry? Don’t be a sucker, and start using the elevator correctly. Most elevators come equipped with a non-stop feature. Press the close door button and your floor button at the same time. Hold the two buttons and the elevator will take you right to your floor without stopping at any others. Get the details in the video below. Your pots and pans come with a handy dandy little holder for your cooking utensils. Coca-Cola is more than just a tasty beverage. You can also use it to defrost windshields, remove rust, get out blood stains, and a whole lot of other awesome stuff. Just check out this video of it removing rust. What? “I’m a great pasta maker,” you’re thinking to yourself. And you might be right about that, but you also might be really really wrong. The golden rules of pasta making are: use a giant pot, fill it with cold water, heavily salt the water, and never add oil to the water. BAM! Amazing pasta every time. Why use paper towels to clean things up when you can use them to cool down beverages? Take a single paper towel, soak it, and then wrap it around your beverage of choice. 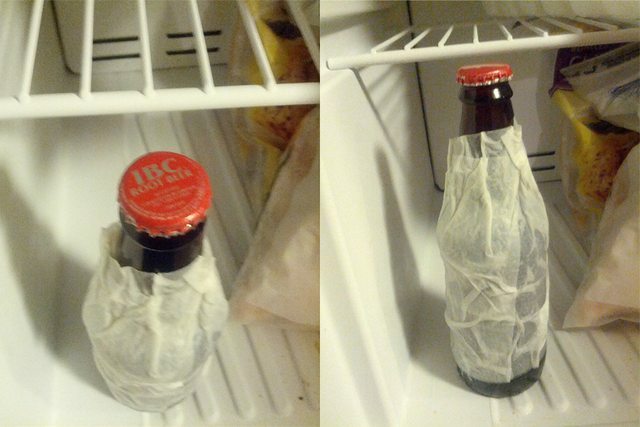 Then put the paper towel wrapped beverage in the freezer for about 15 minutes. Ahh so amazing! I can’t wait to try some of these out. Don’t forget to share this post on Facebook by clicking below.